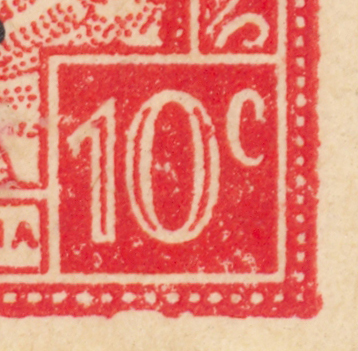 By the small number of these I find in this large selection, this plate variety is likely found in only one position of the plate. 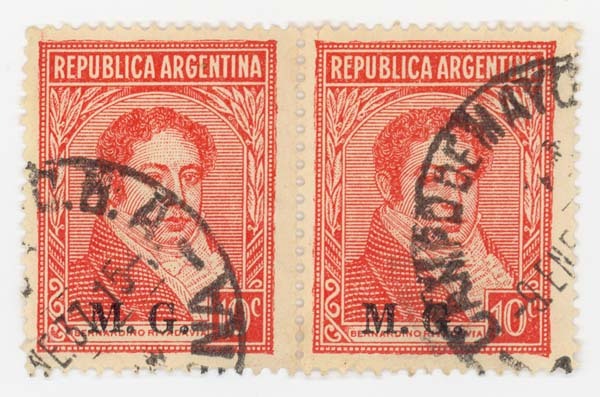 Here are additional examples of this plate variety. 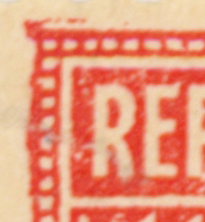 the first reel-fed cylinder of the 10c red had a smaller design not enlarged - it all fits within the 30.0mm height whereas the sheet-fed was 30.5mm high! 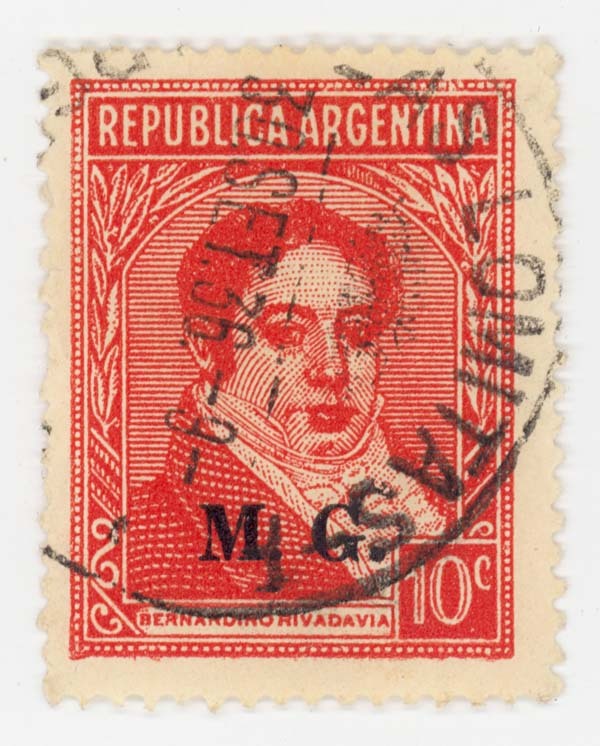 The cylinder was prepared by using loose types all of type II without extra systematical characteristics. 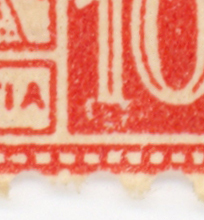 This changed quickly as new features moved in and found their way into the cylinder in a asystematical manner! 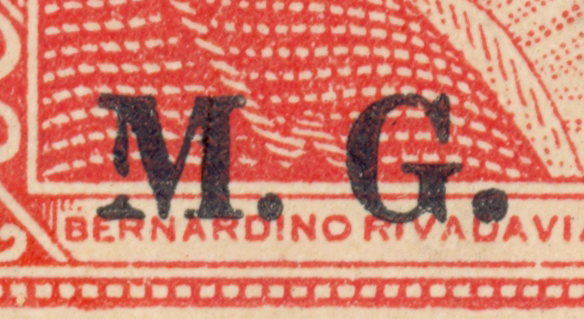 My type IIA [dot above the first "N" of "Bernardino" and III [with the "-" above the "VIA"] moved in in later versions of the reel-fed cylinder! 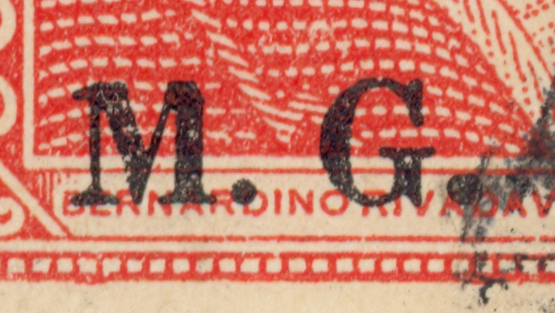 Type IIA probably survived until 1944 but by then the colour had changed into chestnut-brown! 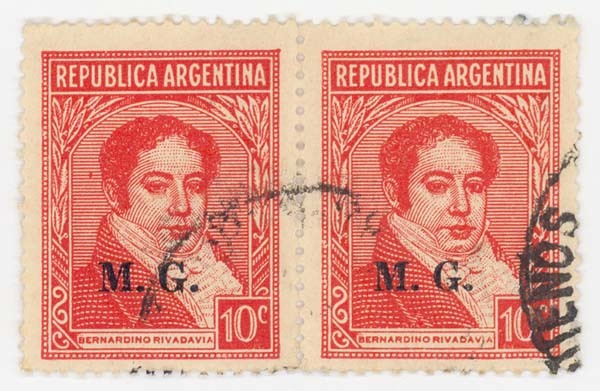 I need to look at these sub-types you mention... Have you looked at the differences in design for Rivadavia's hairline? 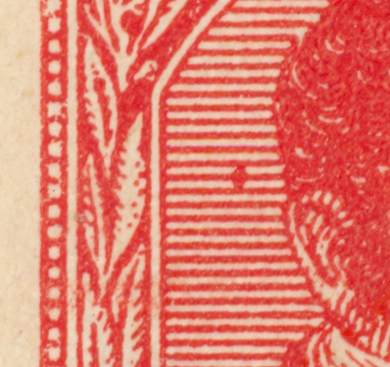 If you take a look at the type II flat selection above, you will see that there is a wide range of hairline types. 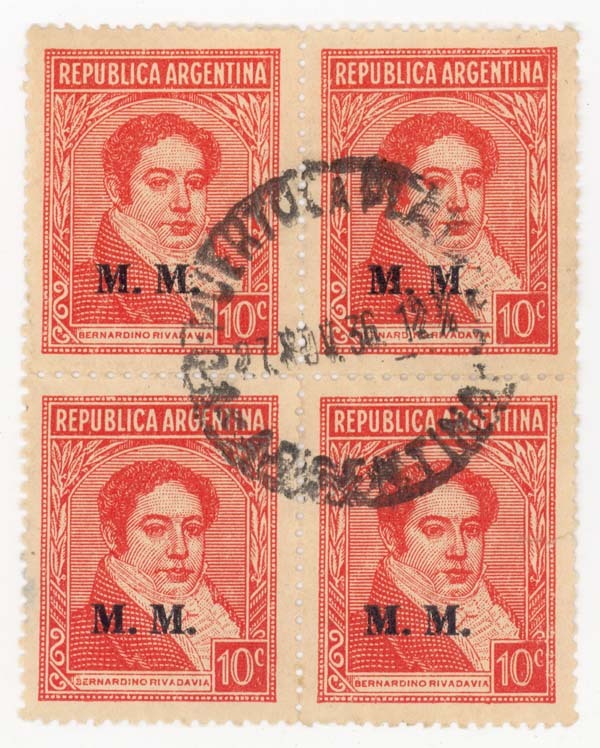 Here is a selection of this rare stamp. 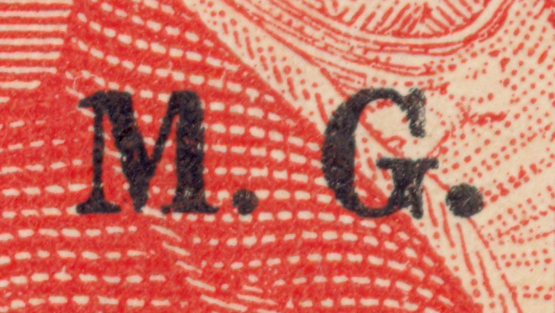 As is the case for all departmentals, usage for each ministry is bound by where the ministry operated. 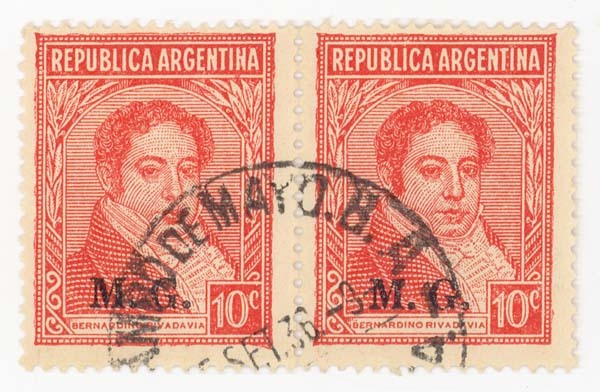 Buenos Aires 10 and 12, and especially Campo de Mayo, are shown here. 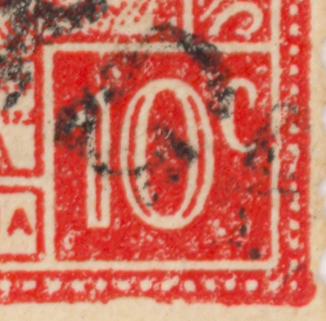 This plate variety is found in one of the master dies, and because the plate was populated in blocks of 2 rows of 5 columns in sheets of 200, there are 20 of this variety on the plate. 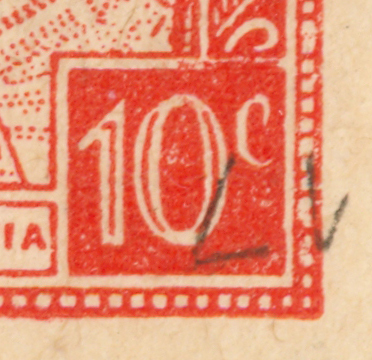 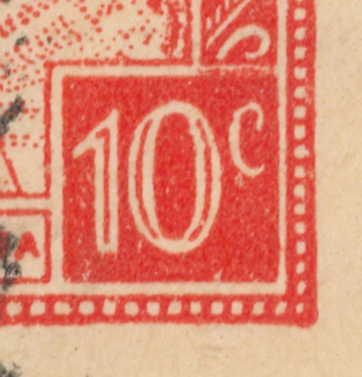 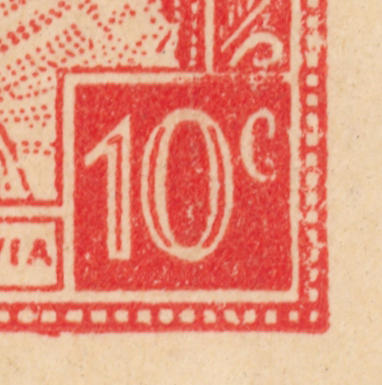 Over-inking is common on the type I 10c departmentals. 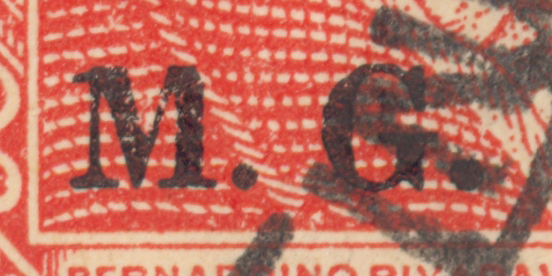 I find several with the same nick to the top right edge of the M.
Here is one with a different nick to the top right edge of the M.
This stamp has a prominent break to the left leg of the M.
I find this plate variety to be relatively common for such a small selection. 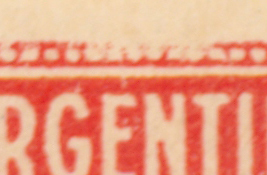 It seems likely that it is on the master dies. 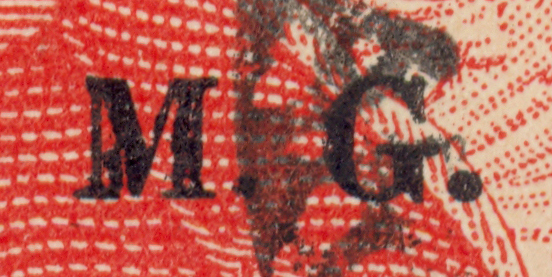 Interestingly, this master die variety is very common for the 10cMM, yet I only found this one example in this rather large selection of these stamps (200 or so). 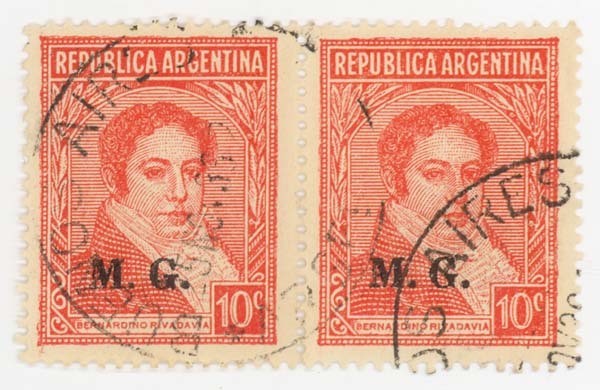 These varieties are repeatable, and likely in the master dies. 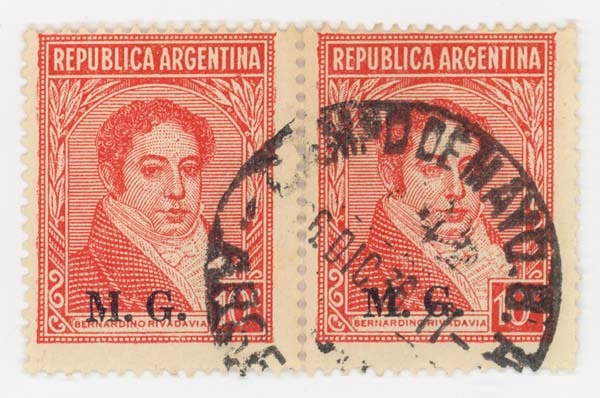 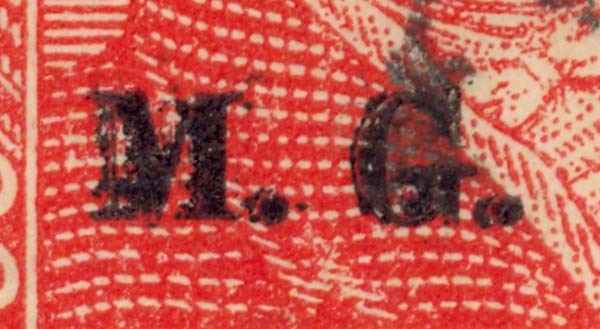 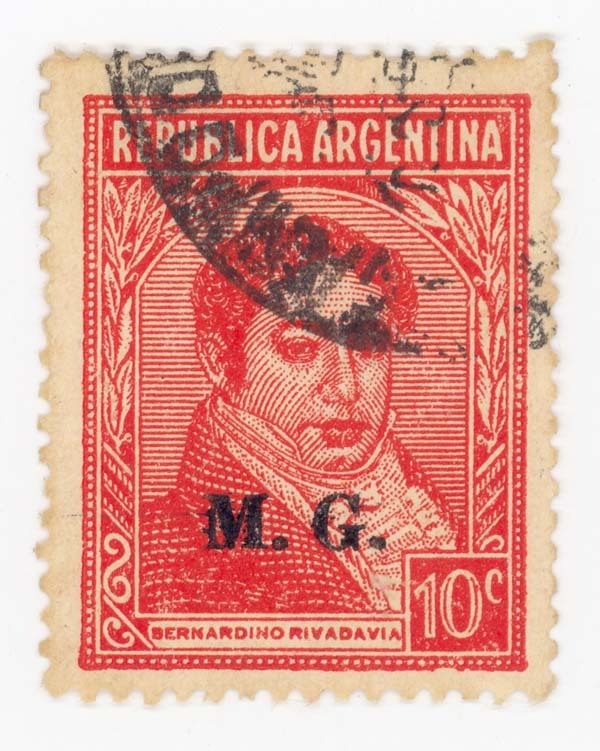 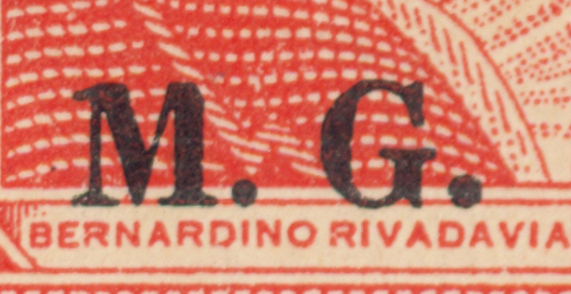 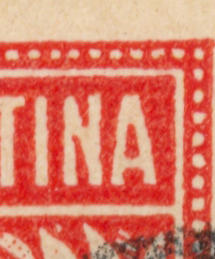 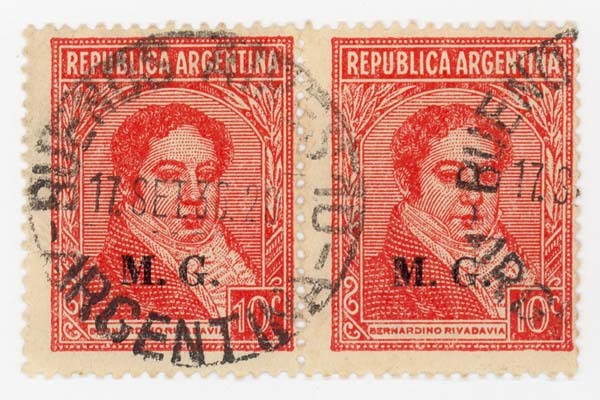 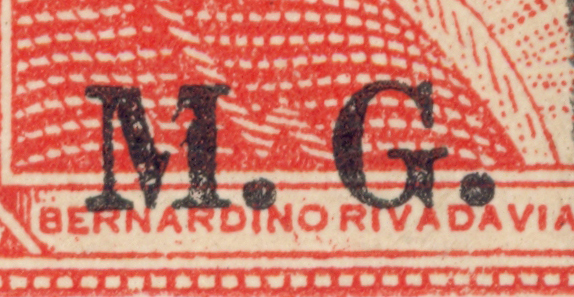 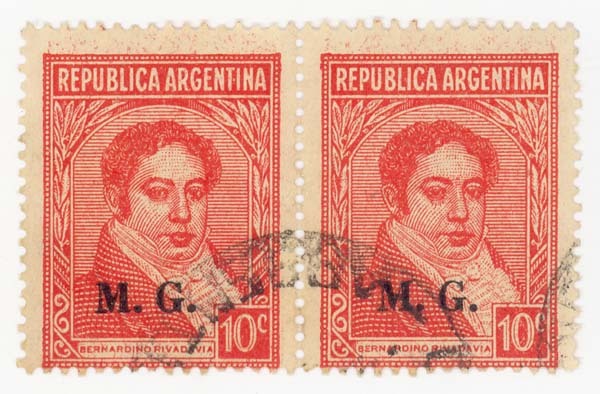 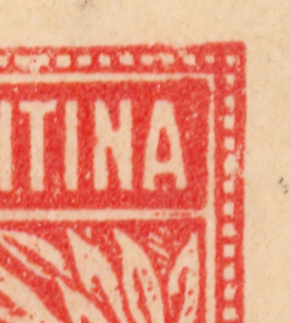 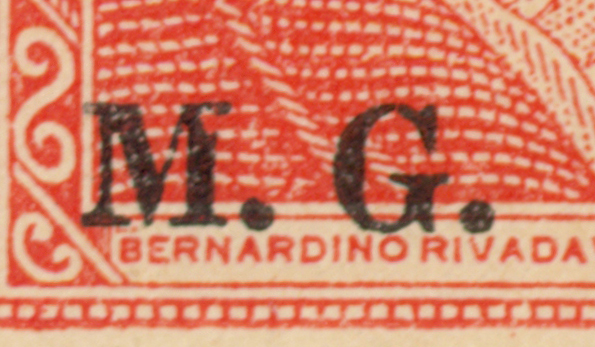 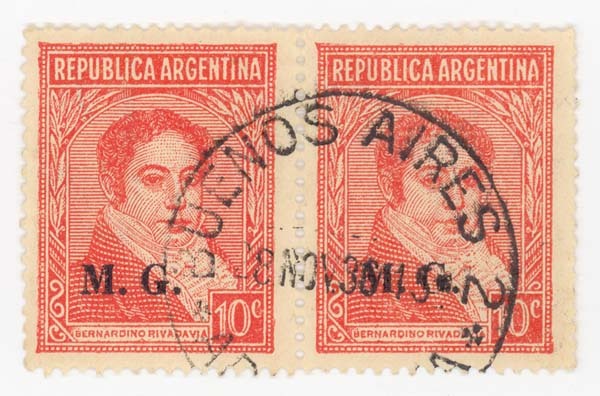 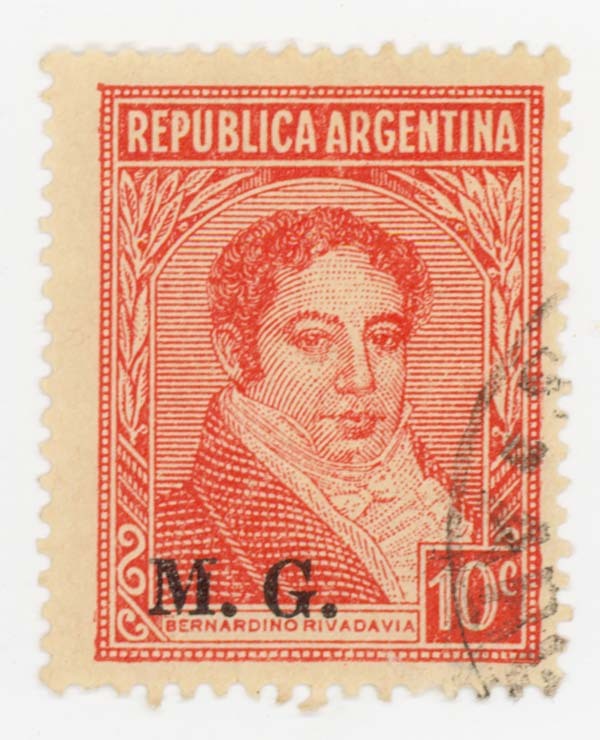 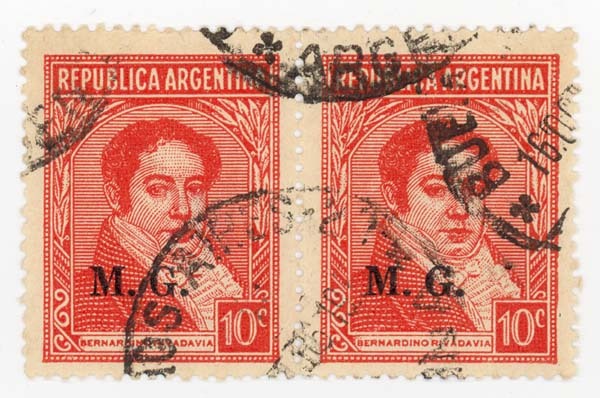 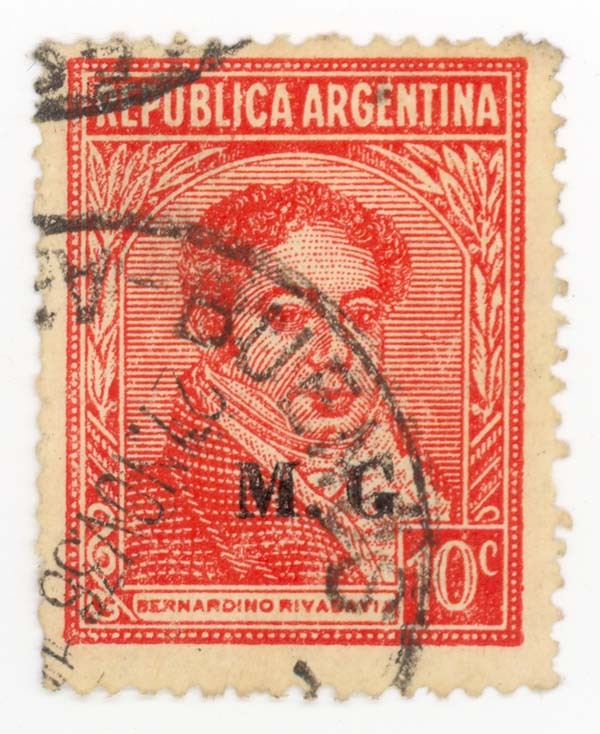 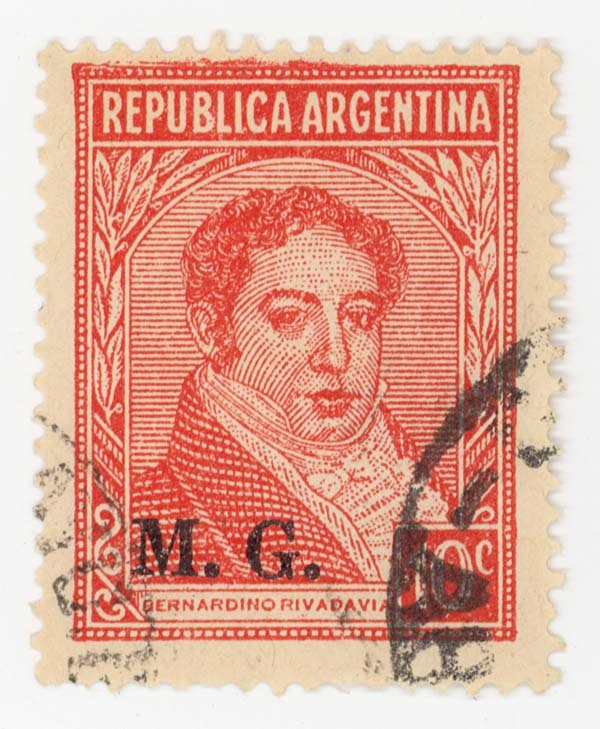 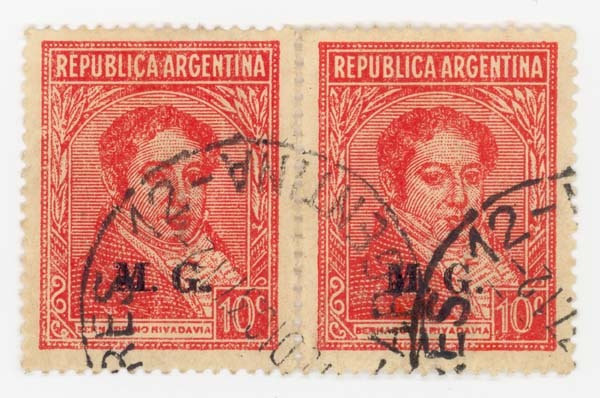 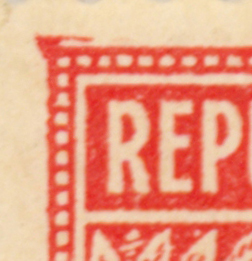 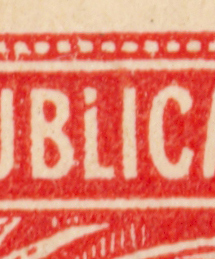 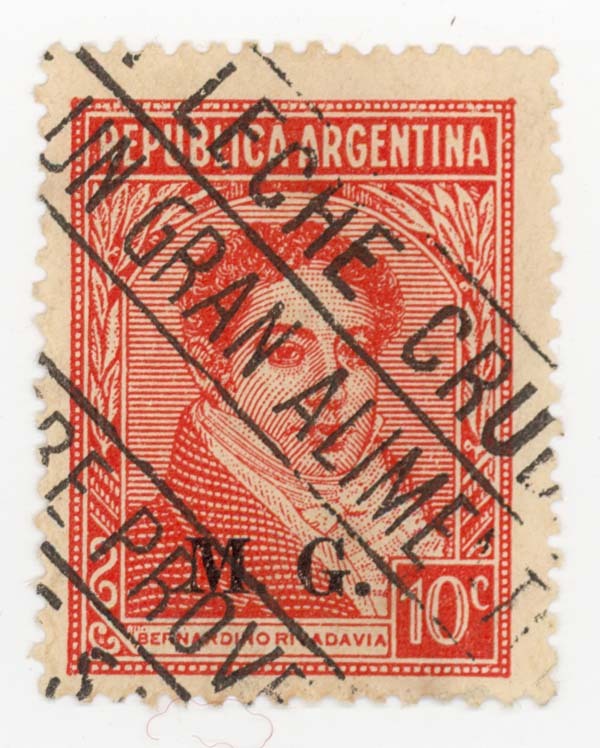 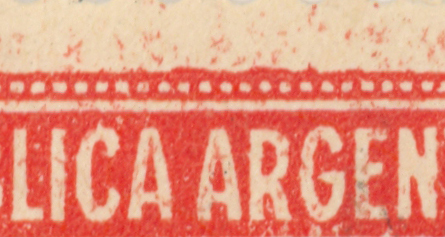 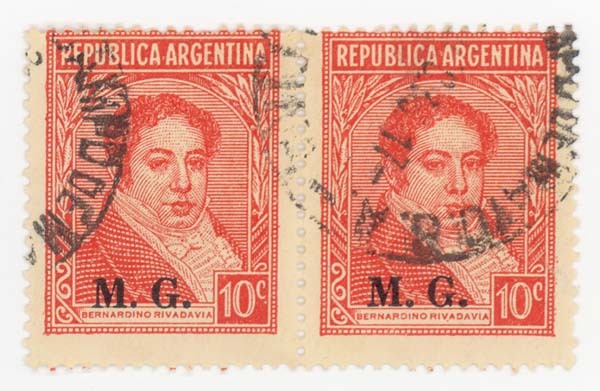 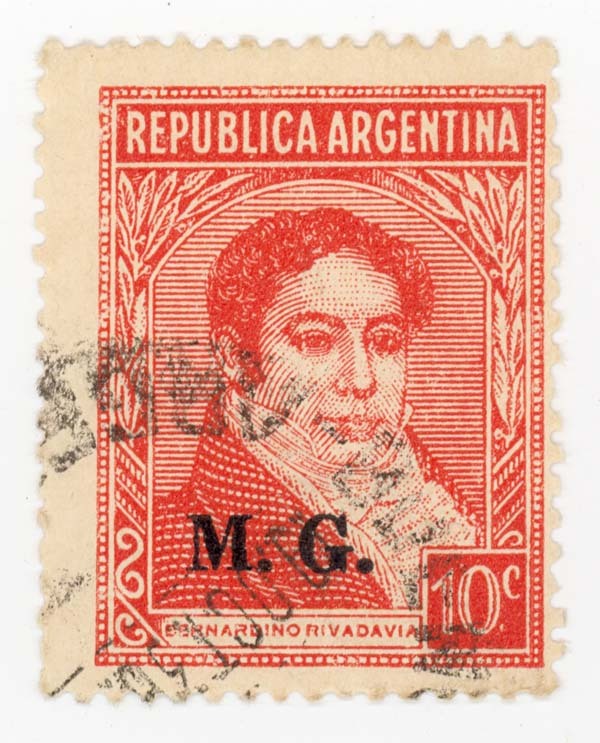 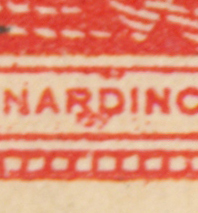 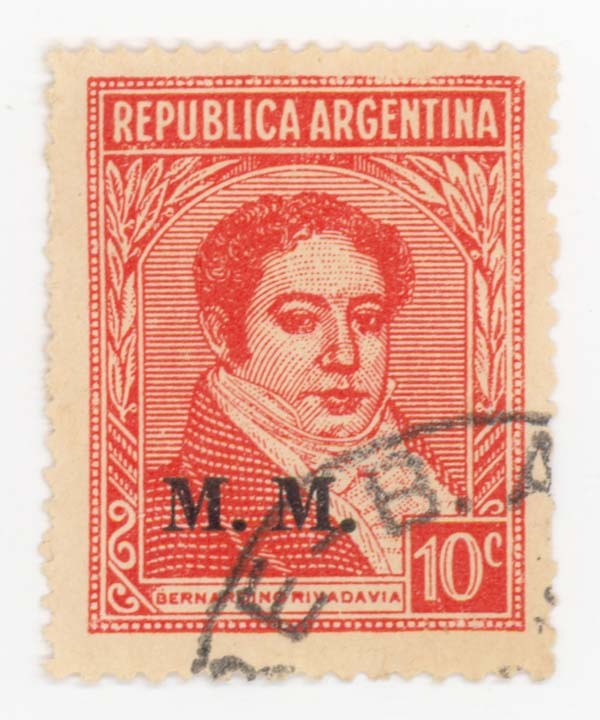 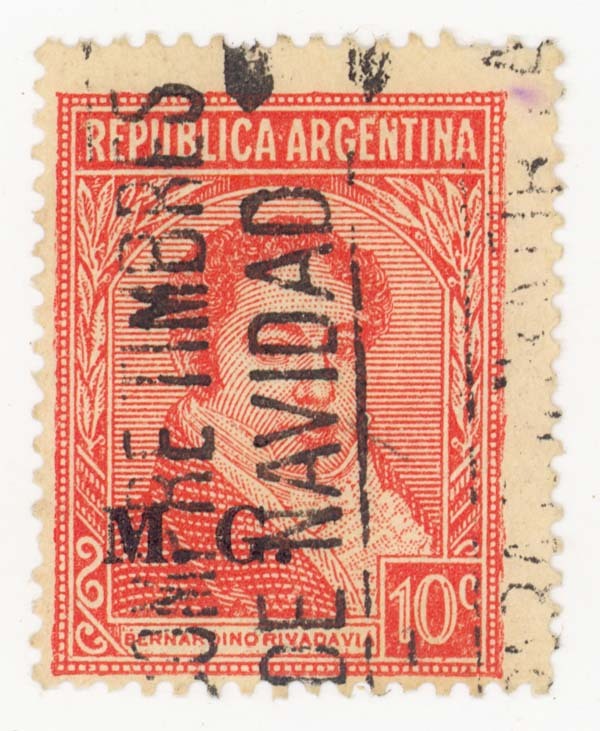 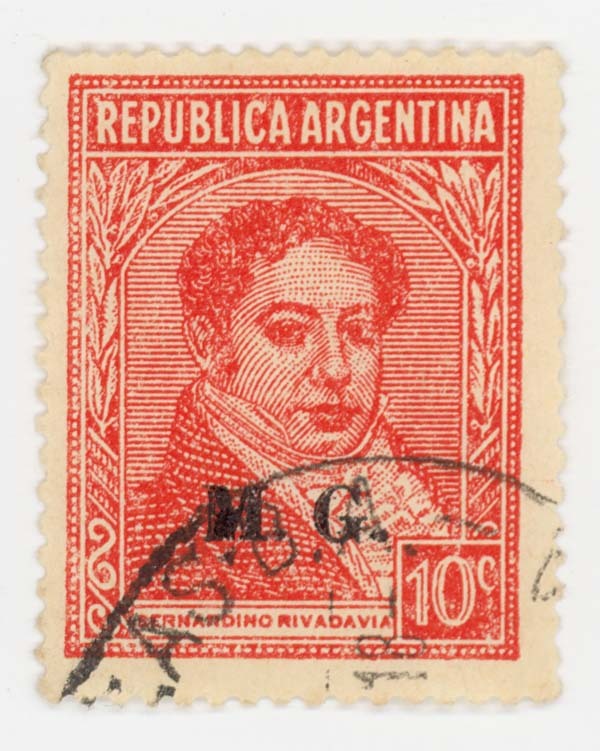 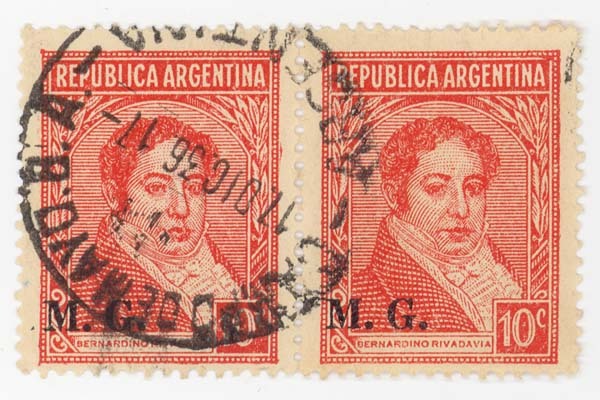 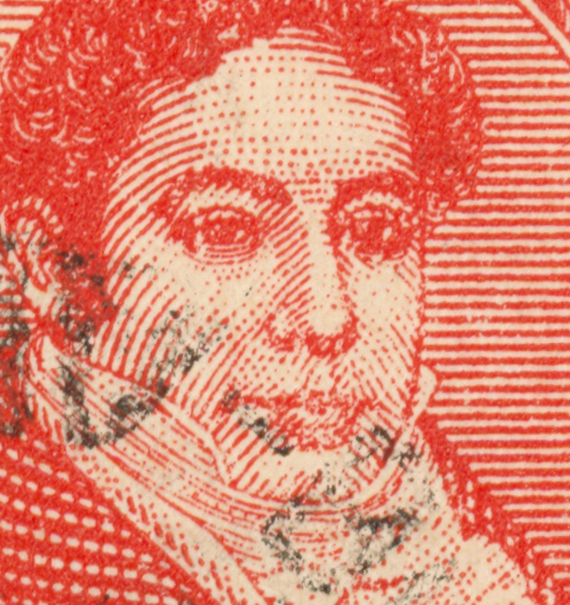 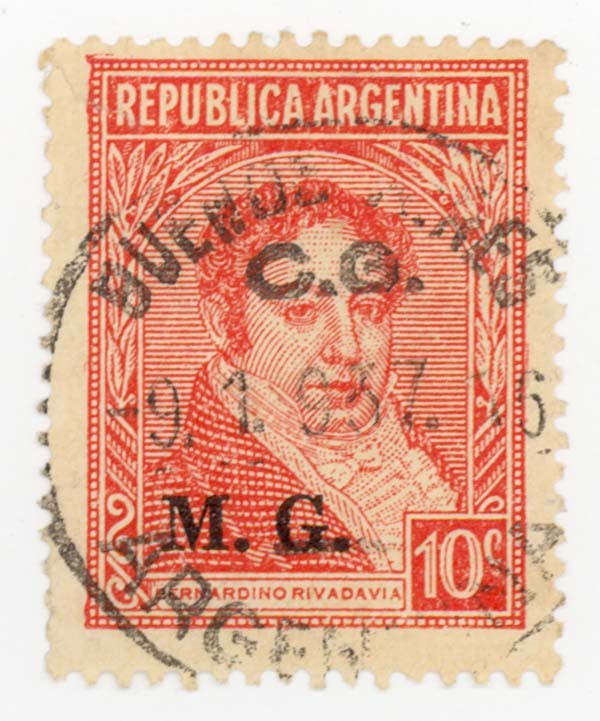 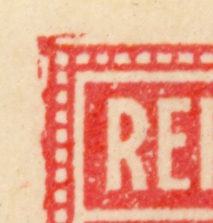 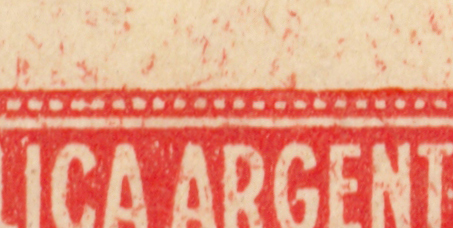 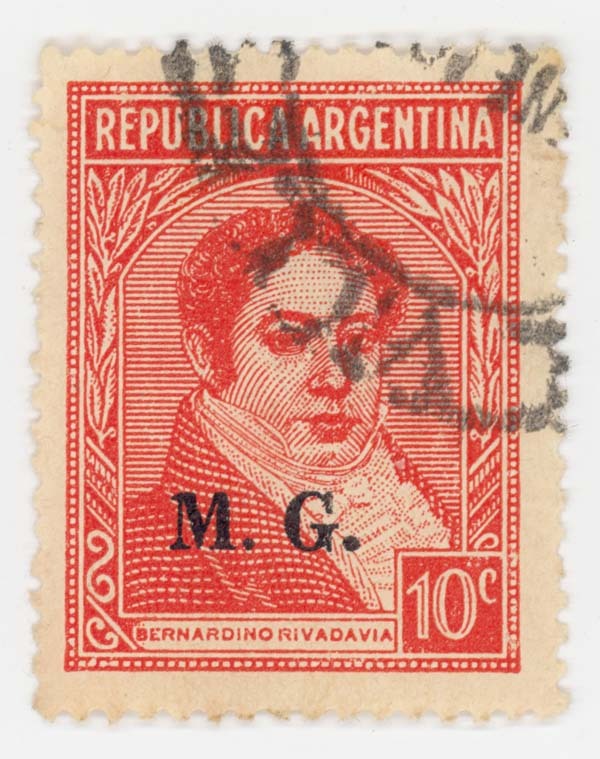 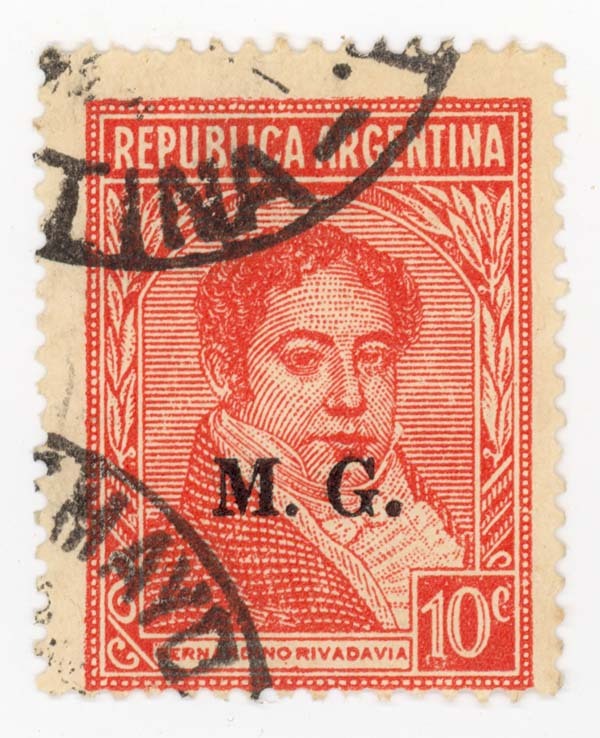 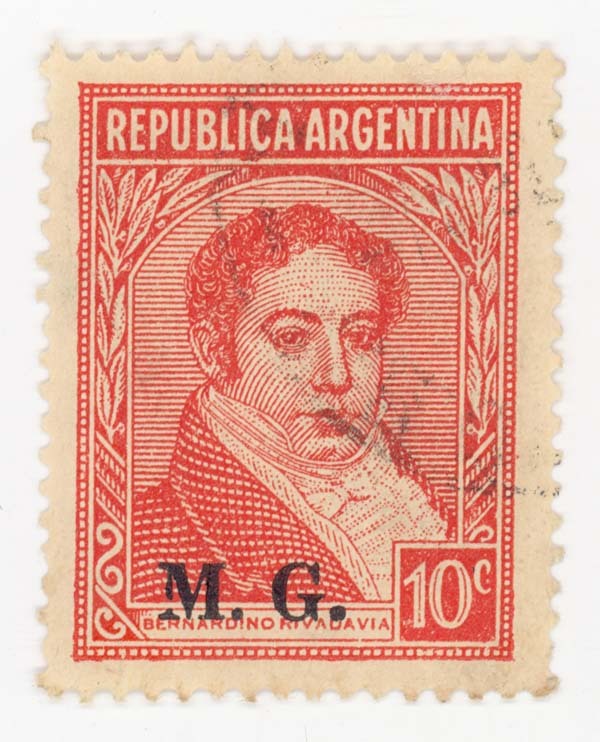 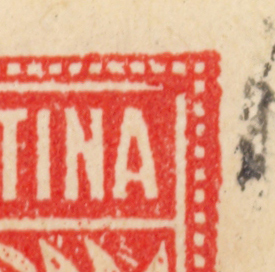 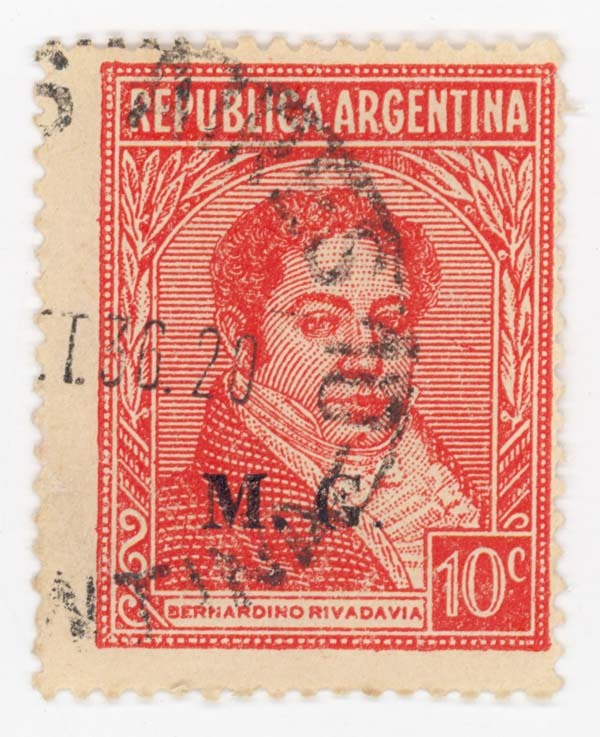 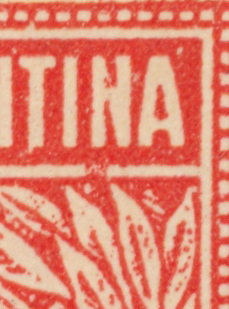 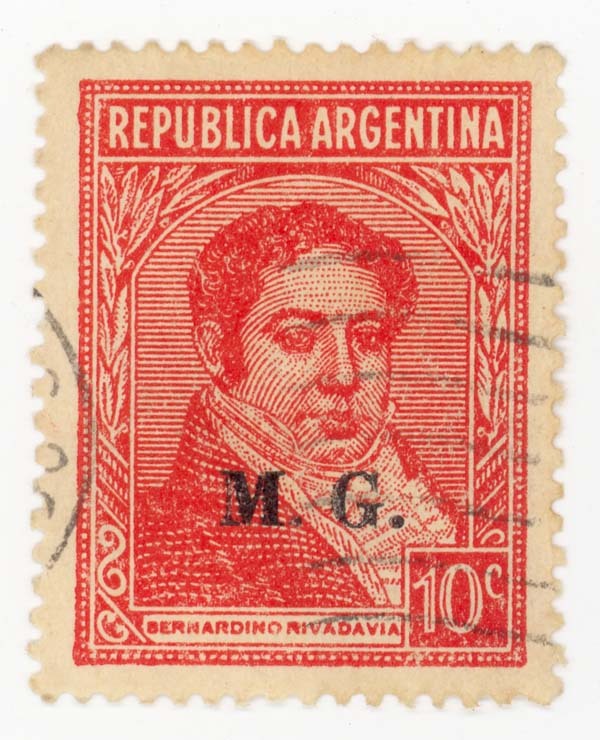 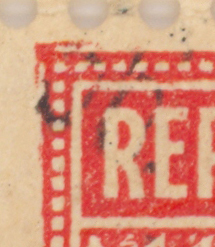 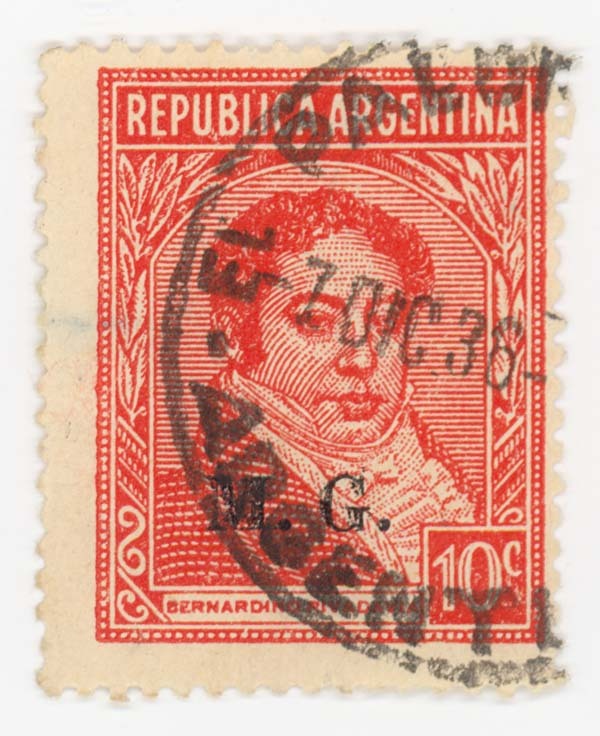 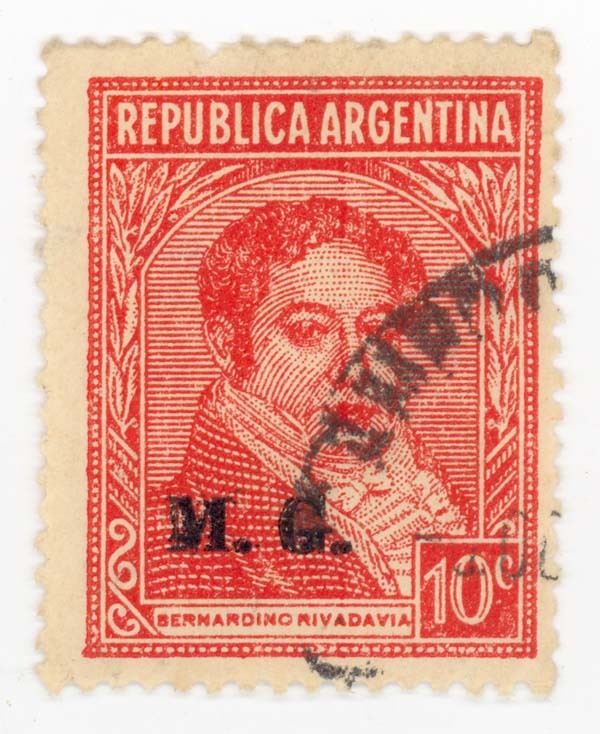 The left stamp has an overprint variety as well as a recognizable plate variety.